I’ve got a piece on this “Cities and Memory” compilation, in which 63 musicians from around the world took field recordings and turned them into “sound art” using prompts from Brian Eno’s famous Oblique Strategies. I made a recording of the sounds of the New Haven green, including city buses, flapping flags, boisterous pedestrians and one a-little-too-close-to-the-mic skateboarder and turned it into a short piece (which you’ll find as #12 on the playlist, if you’re curious). My card “Try Faking It” gave me the courage to roll up my sleeves and dig into this project without overthinking it, and the card “Idiot Glee” told me what parts of the field recording I should use as the foundation of my piece. It was a fun twist on my explorations into fixed media and musique concrète! 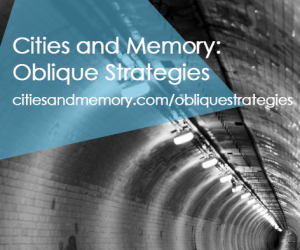 I can’t seem to embed the audio here, but you can listen to it on the Cities & Memory: Oblique Strategies homepage. My field recording is #11 on the playlist and my piece is #12. This entry was posted on April 13, 2015 by natetrier. It was filed under Uncategorized and was tagged with Brian Eno, cities and memory, new haven, new haven green, newhavengreen.